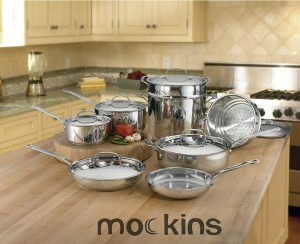 Mockins 15-piece Cookware Set is made up of 15 pieces of premium grade stainless steel pots, pans and utensils with a triply body, 18/8 commercial grade stainless steel and a pure aluminum core as inner layer and induction stainless steel as outer layer for your different cooking needs in the kitchen. You can expect a maximum amount of heat retention and even and thorough heat distribution throughout the cookware, both from the bottom and the sides. The cover seals are also 18’8 commercial grade stainless steel and lock in nutrients and moisture nicely. So you get much tastier and healthier meals. The rating of 4.9 out of 5 stars by 141 customers is very high and shows a very high satisfaction score. 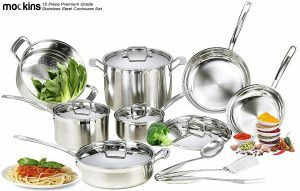 This is a very durable cookware set with cast stainless steel handles attached with rivets which add to the strength and durability. All the covers and lids are made of commercial level stainless steel, and not glass. You’ll find the glass lids on the three-piece steamer pot set. You can use the pots and pans on all types of surfaces, including gas, ceramic, electric, glass and halogen, as well as in the oven at up to 550 degrees Fahrenheit. It is best that you use the pots and pans at low to medium settings. All the pieces are easy to clean and safe to be put in the dishwasher. You’ll get a spoon, a 2 prong fork and a slotted spatula, a 3.5 quart capacity 9.5” covered saute pan, a 9.5 and a 7.9-inch open skillets, an 8 quart capacity 9.5” diameter covered stock pot, a 1.5 quart capacity 6.3” and a 3.0 quart capacity 7” covered sauce pans, a 9.5” steamer insert and cover. The set is offered with one year of hassle-free guarantee and a very generous warranty of limited lifetime. You can contact their customer support if you have any problems or questions about the product and they’ll be happy to assist you. The coating is not non-stick teflon but great quality stainless steel. And you need to use oil if you don’t want the ingredients stick to the base. There is a small hole on the lids as a security feature to help steam and air pressure escape the pot. So there won’t be too much pressure in the pot and no rattling around the pot during cooking. The handles will not get hot to touch on the stovetop, but will do in the oven.The number of pans, the size and the weight are all great and they are all very good quality. And you will definitely get your money’s worth with this set as it will get the job done very well in the kitchen.